On the occasion of the 58th anniversary of Raoul Wallenberg’s disappearance, a ceremony at the synagogue of the Aventura Turnberry Jewish Center, took place on January 17th. On the same date in 1945, Wallenberg was detained by the Soviet army in Budapest and since then his whereabouts are unknown. The organization of the ceremony was in charge of Rabbi Mario Rojzman; William Landa, President of the Aventura Turnberrry Jewish Center and José Weiss, President of the Venezuelan branch of the IRWF. The Monforte de Lemos City Hall, in Galicia, Spain, agreed on January 31st to give a street the name ”Rúa de Raoul Wallenberg” following an initiative of historian Felipe Aira Pardo and the IRWF. The decision was enthusiastically saluted by the President of the Xunta de Galicia, Manuel Fraga Iribarne. A moving ceremony took place at the Buenos Aires Metropolitan Cathedral on January 28th to render tribute to the former Primate of Argentina in the 5th anniversary of his death. It was celebrated in front of the Commemorative Mural that remembers the victims of the Holocaust, placed next to Cardinal Quarracino’s tomb. Organized jointly by the Embassy of Portugal in Argentina and the IRWF a presentation about the Portuguese diplomat Aristides de Sousa Mendes, savior of thousands of Jews and other persecuted during the Second World War, took place at the National Library of Buenos Aires on April 3rd . Dr. Natalio Wengrower closed the conference quoting Sousa Mendes own words: ”I would rather be with God against men than with men against God.” Simultaneously, the New York branch of the IRWF presented a tribute to Sousa Mendes at the Newark Museum, New Jersey. The presentation was organized along with the Portuguese Foundation of Culture and the Mayor of Newark, Sharpe James. On the 60th anniversary of the uprising of the Warsaw ghetto an interfaith ceremony took place at the Buenos Aires Cathedral on April 29. The IRWF paid tribute to Mrs. Janina Klein Dylag, member of the Polish underground resistance that saved the life of a Jewish family persecuted by the nazis. Mrs Dylag lives in Argentina since 1948. The Wallenberg Foundation joined the tribute paid by the Mediterranean Institute of University Studies in Syracuse, Italy, to the Catholic saviour Giovanni Palatucci, former Chief of Police of Fiume. The tribute was paid within the frame of the ”Program of study in honor of Giovanni Palatucci” with the sponsorship of the President of the Italian Republic. Palatucci was murdered in February 1945 at the Dachau concentration camp after saving the lives of Jews, disobeying the orders of the Fascist regime. Organized along with the Goethe Institute the debate ”Argentina and the Nazis” took place on May 8th. The presentation was in charge of the following panelists: Uki Goñi, writer and investigator; Dr. Carlota Jäckisch, senior researcher of the Friedrich von Hayek Foundation and Sociologist Beatriz Gurevich. On May 27th Professor André Chouraqui received the Wallenberg Award for his life commitment to the interreligious dialogue. The ceremony took place at the Argentine Embassy in Paris. 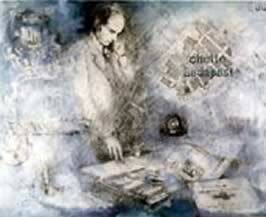 Chouraqui is one of the most distinguished intellectuals of the XXth century. Ambassador Archibaldo Lanús, renowned lawyer and writer, Dr. Samuel Pisar, and IRWF volunteer, Jean Pierre Bendahan, presented the ceremony. With the attendance of Baruch Tenembaum, founder of the Angelo Roncalli Committee, the International Colloquium ”Revisitare Giovanni XXIII” took place on June 3rd in Bologna, Italy. The meeting was sponsored by the Foundation for Religious Science John XXIII. Historians and scholars from all over the world attended the presentation. Tenembaum closed the meeting reading his conference ”The Hebrew World and Roncalli”. At the closure of the Bologna colloquium professor Alberto Melloni of the University of Bologna and one of the highest world authorities about Pope John XXIII, received from Tenembaum the Angelo Roncalli Commemorative Medal, a work of art specially coined by the IRWF. With the sponsorship of the Municipality of Vienna, the Center of Documentation of the Austrian Resistance and the Embassy of Mexico, the ”Gilberto Bosques Promenade” was inaugurated in Vienna on June 4. Bosques was the Mexican consul saviour of Jews and other persecuted during Second World War. Dr. Kloyber presented to the daughters of the diplomat a commemorative medal on behalf of the IRWF. 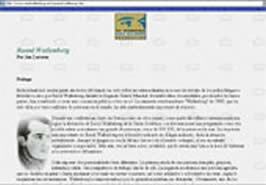 The IRWF designed the first web page dedicated to document the work and rescue actions organized by the Mexican diplomat. The documents were given to the IRWF by researchers PhD. Renata von Hanffstengel and Cecilia Tercero, of the Institute of German-Mexican intercultural investigations. On June 17th the IRWF, the ”National Arts Club”; the ”Committee for Righteous Deed of Temple Shalom for the Arts” and ”The Visas for Life Project” presented in New York the documentary film ”Diplomats for the Damned”. The films deals with the deeds of four diplomats who saved lives. The screening was coordinated by Mr. John Crisostomo, volunteer of the IRWF. On July 29th a ceremony in Montevideo, Uruguay, organized by the Education Committee of the IRWF took place. The Lyceum 53rd was named ”Raoul Wallenberg”. The initiative followed a proposal of Uruguayan Congressman Dr. Nahum Bergstein. An allusive plaque was placed at the entrance of the lyceum. Jean Pierre Bendahan, volunteer of IRWF, delivered a speech during the ceremony. Along with the Goethe-Institut of Buenos Aires, the IRWF continues with the presentation in Argentine high schools about the saviors of the Holocaust, civic courage and the preservation of individual freedom. The program received the support of the Secretary of Education of the City of Buenos Aires. On August 4, 2003 the IRWF donated a Raoul Wallenberg commemorative plaque to the city of Buenos Aires. It was placed next to the statue of the Swedish diplomat, a work by British sculptor Philip Jackson. Buenos Aires’ Mayor Anibal Ibarra, the Ambassador of Sweden to Argentina, Madeleine Ströje-Wilkens and Dr. Natalio Wengrower, Vice-president of the IRWF, delivered speeches. After the ceremony, ambassador Ströje-Wilkens offered a reception to more than a hundred special guests at her private residence. The Dean and the Director of Student Affairs of the ORT University of Uruguay, Charlotte Grünberg and Dr. Miguel Bresciano, respectively, placed a bouquet of flowers next to the Wallenberg monument located in Battle Park, Montevideo. The ORT University of Uruguay and the Israeli Circle of Bolivian dedicated their 2004 calendars to the figure of the Swedish diplomat. Coordinated by Amikam Doron, member of the IRWF, a ceremony took place in Santiago de Chile, next to the Wallenberg commemorative monument. A moving ceremony took place next to the ”Hope” monument, opposite to the United Nations building, in New York. Worldwide leaders sent their letters of endorsement. Among them, US Congressman Tom Lantos and Israeli Minister of Justice, Tommy Lapid, both Holocaust survivors saved by Wallenberg. Wallenberg was remembered in Tel Aviv, Ambassador of Sweden to Israel, Mr. Robert Rydberg, and Professor Jaime Krejner, member of the IRWF, delivered speeches. Delegations of young people placed flowers next to the statue. In the same city where Wallenberg was detained by the Soviet army, a tribute organized with the Wallenberg Association of Hungary (WAH), took place next to the statue carrying his name. Dr. Marcos Resnizky, IRWF special envoy, presented the ”Wallenberg Commemorative Medals” to Dr. Wimmer Gyulane, former secretary and translator of Wallenberg, as well to Andreas Sipos, chairman of the WAH. 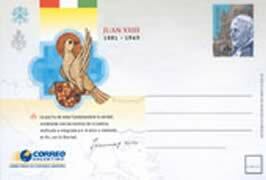 The Angelo Roncalli Committee and the Argentine Postal Service presented a Postal Card dedicated to Pope John XXIII in the Apostolic Nunciature in Buenos Aires. The initiative is in recognition of the man who was called the ”Good Pope” for having saved the lives of thousands of Jews from the Holocaust during the Second World War, while he was Apostolic Delegate in Istanbul. Rabbi Simón Moguilevsky, member of the IRWF, traveled to Brazil to pay tribute to Luiz Martins de Souza Dantas, Brazilian diplomat who saved Jews during the Holocaust. There he participated in an interfaith ceremony at the synagogue of the Israeli community of Curitiba, where he distinguished with the ”Sousa Dantas” medal to Siter Adola of the order ”Evangelical Sisterhood of Mary”. Accompanied by Professor Carlos Coelho, he visited the Studium Teologicum (seminary for the formation of priests) to award Father Victor Calixto Dos Santos, enthusiastic activist of inter religious dialogue, with a medal. He also visited the Raoul Wallenberg Educational Center. On August 26th, 2003, Cardinal Renato Martino, President of the Vatican Pontifical Council for Justice and Peace, visited the Commemorative Mural of the Holocaust victims installed within the Buenos Aires Metropolitan Cathedral. 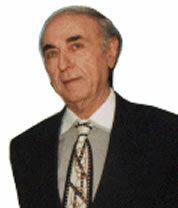 He was accompanied by the founder of the IRWF, Baruj Tenembaum. On September 4th, 2003, the Apostolic Nuncio to Argentina, Monsignor Adriano Bernardini, visited the Mural in remembrance of the Holocaust victims located in the Buenos Aires Metropolitan Cathedral. The documentary, produced by the IRWF, was projected with great success in New York, during the months of July and October. The film was shown at Congregation B’Nei Jeshurun and was later projected at New York University. The internationally recognized film was also chosen to open the Jewish Film Festival in Buenos Aires. A special guest invited by the IRWF was the actress Shifra Lehrer, one of the stars of the film which tells the odyssey of the inhabitants of the first Jewish colonies who settled in Argentina, also known as ”Jewish Gauchos”. On October 16th, 2003, the Congress of the United States awarded Baruch Tenembaum, founder of the International Raoul Wallenberg Foundation, for his more than thirty years dedication to the cause of human rights, education and preservation of memory. The tribute took place in the Capitol and was presented by Congressman Tom Lantos. Lantos and his wife Annette were saved by Wallenberg during the Holocaust. On October 23rd, more than three hundred people gathered at the Embassy of Poland in Buenos Aires to pay homage to Irena Sendler, a social worker who, during the Second World War saved the lives of 2,500 children. During the ceremony a letter written by the Prime Minister of Poland, Leszek Miller, honorary member of the IRWF, especially sent for the occasion was read. The ceremony took place simultaniously with a tribute paid to the savior in Washington D.C. The ambassador of Germany to Argentina, Rolf Schumacher, was invited by the IRWF to visit the Mural for the Holocaust victims installed within the Metropolitan Cathedral. The Ambassador read an allusive declaration to the tragic night. The Vice-president of the IRWF, Dr. Natalio Wengrower, described the characteristics of the Mural which contains the remains of books of prayer found among the ruins of concentration camps. The Church ”Vaterunser” in Berlin confirmed that within the year 2004 a replica of the Commemorative Mural located in the Argentine Cathedral, will be installed within that church. The mural will be donated by the IRWF to the German Evangelical Church (GEC), the main religious organization in Germany. On November 18th, after the brutal terrorist attacks in Istanbul, members of the Wallenberg Foundation met with the Turkish Ambassador to Argentina, Sukru Tufan, to offer their condolences and support to the Turkish people. On November 21st, after the attack committed against the British Consulate in Istanbul, the foundation met with the Ambassador of the United Kingdom to Argentina, Sir Robin Christopher, to express its condolences. Father Horacio Moreno, President of the IRWF; its Vice-president, Natalio Wengrower; sculptress Norma D’Ippolito and the volunteer PhD. Susana Caramelo were present. Following a request by the International Raoul Wallenberg Foundation, two commemorative stamps were issued in Israel with the aim of remembering the heroic deeds of Raoul Wallenberg and of Angelo Roncalli. The IRWF created the ”Committee to honor the Polish Saviors” with the aim of honoring the Polish Citizens who saved lives during World War II. Mr. Lech Kaczynski, Mayor of Warsaw; Mr. Slawomir Ratajski, Ambassador of Poland to Argentina; Mr. Jan Starchnik, President of the Argentine-Polish Cultural Association; Mr. Jorge Wesolowski, Argentine- Polish Cultural Association; PhD Claudia Stefanetti Kojrowicz, historian, director of the website ”The White Eagle” and Mrs. Bárbara Kaminski, publisher of ”Nasza Polska”, are among the members of the committee. The IRWF offered the following conferences during the year: Catholic University of Argentina: ”Wallenberg and Roncalli. Two lives, the same mission” headed by historian Dr. José Ignacio García Hamilton. Austral University: ”Is there discrimination in the media?”, lecture given by the journalist Sergio Rubin. The IRWF honored Max Schmeling, a famous German sportsman. Schmeling, who is 98 years old and lives in Germany, received the ”Raoul Wallenberg” medal from the IRWF for having risked his life when hiding two Jewish children during the ”Kristallnacht” in 1938. In the Argentine province of Santa Fe, on Sunday November 30th, 2003 the inauguration of a sculpture dedicated to the Swedish diplomat Raoul Wallenberg took place. The artistic piece, made by the artist Osvaldo Angeletti, was unveiled by Mr. Baruch Tenembaum in the la square of the Rabbi Aaron Halevi Museum of historic Communal and of Jewish Colonization, run by professor Eva Rosenthal. The IRWF launched a campaign to avoid that educational authorities from Berlin close the Raoul-Wallenberg-Oberschule of Berlin. The decision was postponed until 2005. Mr. José Weiss, President of the IRWF in Caracas, has interceded with the Venezuelan authorities for the future inauguration of a public space dedicated to the Swedish diplomat. Following a proposal made by the IRWF, the Israeli Postal Service issued stamps dedicated to Gaston Champagne, Josephine Champagne, Maurice Pochet and Yvonne Verly Broche as a recognition to the rescue actions carried out by these saviors during the Holocaust. The ”Raoul Wallenberg Medal” was sent to the Sephardic Museum Legacy of Seville in Spain where it will be exhibited permanently as a remembrance of the heroic gesture of Raoul Wallenberg. 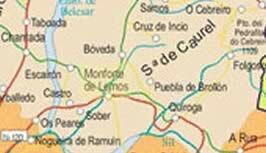 The City Council of Monforte de Lemos, Galicia, Spain, officially communicated by means of a decree, that a street of that city would be named ”Rua Raoul Wallenberg”. The Mayor, Nazario Pin Fernandez, and Delegate Felipe Aira Pardo took charge of that initiative. A plaque in Wallenberg´s honor will be installed there. With the collaboration of the Swedish Ambassador in Argentina, and of the Swedish Institute, the IRWF has for the first time translated into Spanish the Raoul Wallenberg’s biography by Jan Larsson . The aforementioned is available in IRWF website. Following an initiative of the Roncalli Committee of our Foundation, the Argentine Postal Service has announced that it will be issuing a commemorative stationery postcard dedicated to Monsignor Angelo Roncalli, savior of Jews and others persecuted during the Holocaust. Monsignor Roncalli was elected as Pope John XXIII in l958. The Commission of inquiry into the actions of the Swedish foreign policy leadership in the Raoul Wallenberg case has presented its report ”A failure of diplomacy”. The Argentine branch of the Wallenberg Foundation supports the international statement in which the post-war Swedish government was seriously questioned for its inaction in not firmly demanding the liberation of Raoul Wallenberg from the Soviet Union. We have followed the celebrations that have just taken place in Bulgaria and in all the world to commemorate a heroic event, the salvation of the Bulgarian Jews during the Holocaust in l943. With the help of the Bulgarian people that confronted the Nazis together to save their compatriots, they succeeded in preventing the Bulgarian Jews from being deported to the Nazi extermination camps. Baruch Tenembaum was invited to participate on behalf of the Angelo Roncalli Committee at the Conference ”Revisit John XXIII”, that will be held on June 2, 2003 in Bologna, Italy. Tenembaum will speak about the humanitarian actions of Nuncio Roncalli (later named Pope John XXIII) in favor of the Jews persecuted during the Second World War. With the approval of the German Evangelical Church – EKD – the IRWF will donate a replica of the Commemorative Mural to the victims of the Holocaust, installed in l997 in the Cathedral of Buenos Aires. The replica will be located within the Church of Our Father. In this way, Berlin will become the second city in the world to possess a monument with such characteristics, unique in the history of Jewish -Christian relations.